1 photograph : b&w ; 20.5 x 25.9 cm. 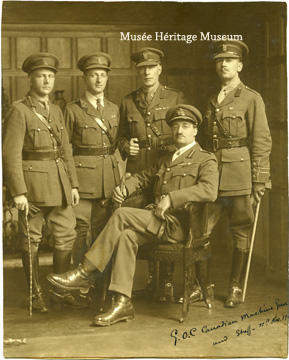 This photograph depicts Brutinel in military uniform seated with four members of his Machine Gun Brigade standing behind him. From left to right: Captain J.K. Lawson, Major J.D. Foster, Captain M.R. Lever (Marshall), and Lieutenant P.M. Hume. An inscription on the photograph reads "G.O.C. Canadian Machine Gun and Staff--11th Nov"